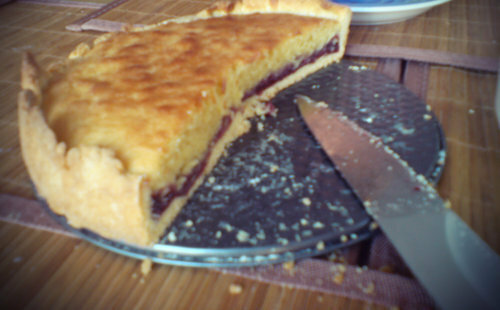 My mother is a huge fan of the bakewell and makes it regularly and rarely strays from using an apricot jam, so much so that I forgot it was possible to make it using other jams. It is also possibly the reason why I have shied away from making it as I, well lets say I’m not a huge fan of apricot jam, or almonds for that matter. I found this recipe incredibly easy to follow and was both delighted and relieved at how well it turned out because 1, it was my first time to make it and 2, himself’s mother was coming over her dinner and this was on the menu for dessert, and added points, it turns out that it’s one of the Mrs L’s favourite desserts! Freezing the pastry is very important as is using a very good jam. I used a fabulous homemade raspberry jam I had picked up in a market. 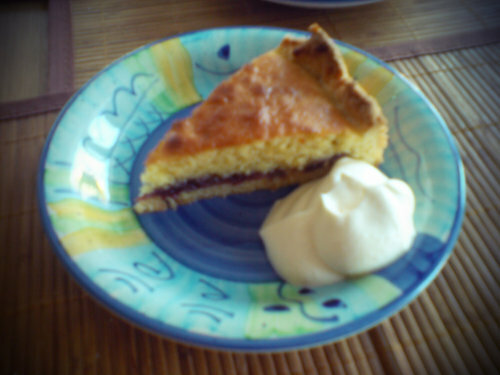 The only slight adjustment I made to the presented recipe was to replace the almond essence in the frangipane for vanilla.